Description Created a fort and soldiers have been pouring in since day one. Despite having a visitor cap of 20 for a year (triple-checked init file to make sure), they keep arriving and there's about 50 of them. Furthermore, when I order the military to kill one of them, the rest of the visiting soldiers get weird and start meandering around interrupting citizens, chasing them for a second but then walking away without actually attacking them. Most of the soldiers are locked up in the former tavern (hotkey f2), but there are a few escaped ones around hotkey F6 displaying this behavior with citizens. Can confirm this happening to me as well. "The visitor cap doesn't work it seems, tavern keeps filling up with people even though it's set low." "I believe questers ignore the caps now. There's a gray area there and we'll have to deal with it somehow." While in my fortress they didn't appear until I built a tavern, after that they just don't stop coming. There must be about a hundred. Forbidding the tavern to outsiders doesn't work, though they stop socializing. Yes can confirm. The questers never leave the fort, keep piling up more and more until FPS death. Yeah, it is pretty game breaking. Happening to me too. I am in year 1 of the fort. Just built a tavern, I don't have many buildings yet. 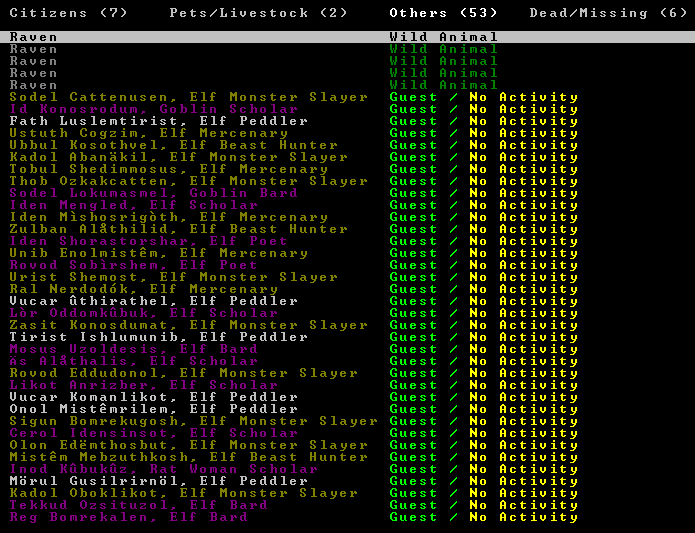 I've got 77 visitors, all warrior types, just piled into the tavern. They are all asking questions and seeking information. I have got VISITOR_CAP set to 25 in d_init.txt. They gradually started to leave all by themselves, but I still have about 40 left. Relevant info: I've had these fuckers show up even WITHOUT a tavern. At least it's not as extreme as 77 in year 1, but sweet Armok. Anecdotally i have also experienced a dwarf soldier listed as 'friendly' not a visitor entering & leaving the map with a 90% turn west entry to north exit, seemingly pathing through my site. I currently have my eyes peeled to see if i can experience it again and get more info. Is this related to civilisations sending out artifact questers who use the road connections/travel through your site to another location? Another note, I've noticed if I leave the questers as a meatshield for the nearby tower, every dwarven visitor out there who dies seems to be treated as a citizen, demanding burial in MY catacombs. Cap-ignoring questers can also freeze out cap-respecting visitors (0010412).